Do you ever wonder what was from long ago in the house you live in today? Well, this has been one of those adventures of finding out. I decided I'd go into the backyard where the dogs used to reside and finally dig up the remains of what I was sure was an old BBQ build out of red brick. The only thing showing of the old BBQ was the very bottom layer of red brick was mortared to cement. What I didn't know at the time was how much cement there was. So I grabbed some tools and some more tools and yet more tools because as I worked and worked to remove this stubborn piece of yesteryear protruding above the dirt and pea stone, I discovered that there was an entire patio buried beneath. Ooooh, gold mine! So earlier in the year I had set up a temporary fire pit on the other side of the yard, but this new found gem has gotten my mind thinking. This my friends is how projects are born! First off the new patio had a few problems. One was that in order to put this monstrous fire pit down I would have to level the patio pieces which had heaved a little over time. So I made a frame and poured some concrete. 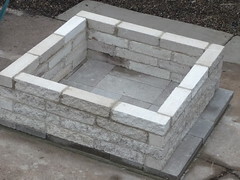 Then I situated stepping stones on top of that then mortared together landscaping brick on top of that. So what I didn't use "fire brick", which I honest still don't know what that is, but this was a cheap project that hopefully will last long enough; plus I wasn't using these bricks for anything anyway! There's a whole bunch of ideas running through my head as to what I'm going to do with my newly found play area.